The following is a "drabble," a form of ultra-short flash fiction that is exactly 100 words in length. Not surprisingly, telling a story with meaningful characters, a compelling world, and weighty events in a 100-word space can be difficult. 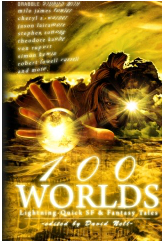 While this story was accepted in the 100 Worlds anthology from Dreamscape Press, it seemed silly for me to charge for such a short tale as a stand-alone item. So I offer it here for visitors to enjoy. Please enjoy the (very short) story below. Just after Joey turned fifteen, his dad left to become a cyborg. His dad sent money, but he joined a hive in Minneapolis and plugged in. Joey’s mom left to join her husband two years later. On Joey’s birthday, he stood among the trees outside the conversion clinic, studying the leaves, deciding. One fell into his hand. “Now you’re free,” Joey said. But the leaf was brown and dead. Head down, Joey carried it inside.